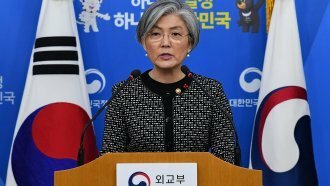 South Korea's Ministry of Unification said Tuesday the government proposed a meeting between the two countries on Jan. 9. South and North Korea could soon hold high-level talks with each other. The agency said in a statement, "We hope South and North Korea can sit face to face and candidly discuss on issues of mutual interest concerning the improvement of inter-Korean ties, along with the North's participation to the Winter Olympics." The announcement comes one day after North Korean leader Kim Jong-un extended what seemed to be an olive branch to South Korea. As of Tuesday morning, North Korea had yet to respond to the South's proposal.